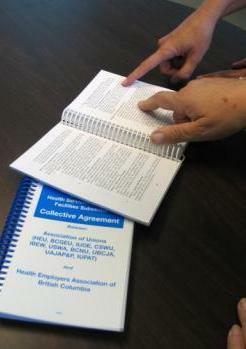 Your collective agreement is a legal contract between HEU members in your workplace and your employer. It outlines wages, benefits and other workplace rights. It's a powerf ul tool for defending your rights and protecting you from unfair treatment. There are currently more than one hundred different collective agreements that HEU members and staff have negotiated with employers. Three out of four HEU members are covered by the Facilities Collective Agreement, which includes most funded hospitals, long-term care sites and other health authority operations such as those delivered as shared services. More than 270 job classifications in our union are covered by this agreement. Other HEU members provide care to British Columbians in the community and in the home. Some work for publicly funded community health agencies providing everything from home support to day programs are covered by the Community Health Collective Agreement. Others provide residential and community-based support services to people with developmental disabilities, women and children, and First Nations clients. Many of these members work under the Community Social Services Collective Agreement. As a result of privatization and contracting out, many support workers, who provide housekeeping and dietary services, are employed by multinational corporations. Most have joined HEU and we have negotiated a number of agreements including Acciona (VIHA), Aramark (FHA), Compass (VIHA), Compass (PHSA), Compass-Marquise and Sodexo. HEU also represents hundreds of health care workers employed at six different First Nations health delivery organizations. Finally, nearly one in five HEU members works under an independent agreement with private and non-profit facility operators or subcontractors. Dozens of different collective agreements cover these work sites. Looking for a copy of your collective agreement? Follow the links below, or please contact your local executive, shop steward, or the nearest HEU office to obtain a copy of your collective agreement.